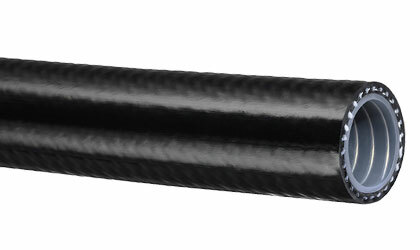 K9593 series hose features a clear phthalate free PVC/polyurethane core, galvanized steel wire helix, high tensile strength yarn reinforcement and black phthalate free PVC cover. Hose complies with applicable FDA requirements. More flexible than other similar hoses for ease-of-use and resists damage from constant flex applications. Steel wire helps prevent the build-up of static electricity for added safety. Abrasion resistant cover resists wear and is MSHA accepted for use in mines for transferring air, oil, water or other fluids. Heavy duty construction results in a highly durable product, for both indoor and demanding outdoor applications. Click here for more info.